Not too long ago I received an email from Quarto publishing asking if I would be interested in receiving a copy of a new book by Laura Rowe, food journalist and in her own words gin drinking editor of Olive magazine. The book is called ‘Taste -the infographic book of food’, of course I accepted, any request to add to my collection of food books always excites me and will always be gratefully received. I had come across infographs briefly before in a presentation at work, according to Wikipedia information graphics of infographics are graphic visual representations of information, data or knowledge intended to present information quickly and clearly. In her introduction Laura tells us that that she had spotted an infograph a while ago estimating that we consume up to 285 pieces of content just through social media every day, this I can believe. For those of us of a certain age, cast your mind back to the not too distant past pre-internet and pre social media and back to a time when telephones were just telephones, our main sources of gathering information and knowledge would be books, newspapers, television and radio, move forward to 2016 and the number of sources we have now are almost infinite. Very much like Laura, I wake up, check Facebook, Instagram, Twitter, see what emails I have received and scan the news headlines even before I’ve got out of bed. My life, in fact most of our lives these days is all about information consumption and again like Laura, for me in particular food consumption, and lots of it. I do have a bit of an obsession with food and it is a continuous journey of discovery for me, there is always something new to learn, taste, see, experiment with and understand and whilst there was a fair amount of information in this book I already knew there was also a fair amount that I didn’t and using infographs for me is a quick, useful way of learning, especially if you like visuals and straight to the point information. Taste has seven chapters taking you from the plot, off the farm, out of the water, into the larder, onto the table, and Laura being a gin fanatic there had to be a section from the bar, without fail, mothers ruin is included. There is also a lovely little section at the end called ‘Any other business’, which in most books is the boring stuff like conversion tables, but in Taste it takes it to another level meaning this is the book you’ll be more likely pick up for that kind of quick information. 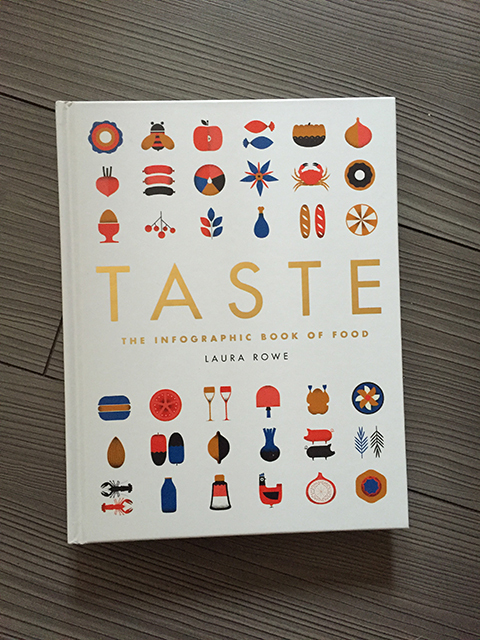 Taste is a great resource book, it is great for any age and for anyone who has an interest in food. It is brilliant to use as a trivia book and great at testing fellow foodie’s knowledge. It was a complete shock to learn which country was the biggest producer of milk, that I was a mycophile, that squash was technically a fruit, that the inside of a cucumber was cooler than the outside. Do you know what a puftaloon is or a hogget, or a kiviak? What is the most expensive cheese in the world? And did you know that tofu was not a sponge and is useless at being marinated? I do have some feedback though, and this is purely personal but for me a fish finger sandwich should have ketchup and not tartare sauce and a chip butty should be in a bap. You see, this book can even create a few debates.